Somehow it’s Thursday already and I’m now approaching the 25 week pregnancy mark. I’m becoming convinced this means I am stuck in an alternative universe where this pregnancy just whooshes by without me even realising it. Bump-wise, I’m feeling about a million times better. There’ve been no more scary situations *touch wood* involving trips to the hospital and the baby continues to make his or her presence known with many a kick. I’ve noticed the kicks get stronger when I’m sitting down or in the bath, and it’s been lovely for the (self-proclaimed) Northern Love Machine to feel more kicks too. Now the bump is bigger, my early pregnancy body hang-ups are pretty much gone and I’m actually enjoying being pregnant (although I do miss the wine). I loved this post from Susanne over at Ghostwriter Mummy linked up to last week’s #BlogBumpClub. I could really relate to that feeling of being uncomfortable in your own skin in those early weeks of pregnancy. At the moment I’m on the hunt for maternity clothes suitable for summer, so if you have any recommendations let me know. I could do with a couple of comfy, flattering summer dresses to see me through the next couple of months – especially as my maternity clothes from last time were for a different season. I seem to be living in my black maxi dress at the moment (a non-maternity number from Asda George that gets shorter as the bump gets bigger) and a really cute grey jersey maternity dress from Asos. My Next boyfriend maternity jeans and stripy Asos vest are also getting a lot of action, as are the maternity trousers I got from Topshop recently. If you’re looking for maternity style inspiration check out this post from last week’s #BlogBumpClub from Four Hats and Frugal. Not sure I have the legs to pull off this look – still, it’s nice to dream. So how have you been? What are you wearing? Have you felt much baby movement? Are you battling cankles like me at the moment?! Link up your most recent pregnancy post and join our blogger antenatal club. Don’t forget to grab the badge (below) so you can let others know about us too. 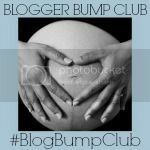 Plus, there’s always plenty of pregnancy-related chat over on Twitter if you follow our hashtag #BlogBumpClub (I’m @mollyjforbes on Twitter by the way). H&M are normally good for summer dresses but that being said I’ve not looked at anything yet! I’ve been using hand-me-downs and clothes from my last pregnancy so far! I too am in need of maternity clothes. I finally have a bump that fits nicely when I wear my Isabella Oliver pencil skirt and with a black vest it looks like a dress so I guess its like two outfits in one! I have non maternity stuff that I can still wear but like you I’m after more summer stuff- especially since we go to Sicily in August. My H&M Mama jegging are definitely my most worn item so far! My absolute favourite maternity clothes this time round are from Seraphine. They are more expensive than some other brands (but not too crazy if you wait for a sale) and they are just so comfy and wash like iron – I’m definitely co-opting a few bits back into the non maternity wardrobe! I’m glad you’ve had a calmer week – fingers crossed it stays that way for a nice boring next 15 or so weeks! I haven’t got anything by Seraphine but I’ll certainly be checking those out now. I’m all for using maternity clothes after the baby is born too! I think New Look do a great range of inexpensive maternity clothes. I have a couple of bits, but have my eye on a maxi dress that I may have to get for the summer hols! The Asos vest is now one of my favourite tops – love it and it’s SO comfy!